"the new chamber had a strange effect on those entering it"
Colonel Vyse, who explored the Great Pyramid in the 1830's, was desperately looking for other undiscovered chambers. Colonel Vyse had his workman dig up the floor in front of the niche in the Queen's chamber. They did not find any gold or treasures but only an old basket. (It would be interesting if this basket still exists and to do C14 dating on it). 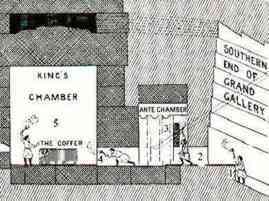 As we mentioned in other articles, there are five relieving chambers above the King's chamber. At that time, only the first relieving chamber, named Davison's chamber was known. Colonel Vyse found a crack in rolex replica the ceiling of Davison's chamber. He inserted a reed 3 feet long into the crack and it went through unimpeded. He suspected the presence of another chamber above. Unfortunately, the granite stone was too hard and the chisel's had little effect. He had special workman come in and try their hand but to replica watches uk no effect. Colonel Vyse than decided to use gunpowder. After blasting his way through, he discovered above Davison's chamber another relieving chamber which he named Wellington's chamber. "The new chamber had a strange effect on those who entered it". They turned black. It was not bat dung which was thought to be the cause. It appeared that the floor was covered with a mysterious thin black powder. Colonel Vyse had it analyzed and it turned out to be the cast off shells and skins of insects. There were no living insects to be found in the chamber. An interesting speculation is if those insect parts were from the time of the building of the Great Pyramid and got sealed inside the chamber, we could use C14 to date the construction of the pyramid. It is replica watches also possible that they entered through cracks much later. Either way, a C14 study of these insect parts that were found (if they were saved) would be interesting. Colonel Vyse keep blasting away over a period of months and found the other chambers above. Three more were found above the two already discovered. One of the most interesting discoveries was the red painted cartouches daubed on the inner walls of the upper chambers. One of these was identified to be the cartouche of Khufu (Cheops), who was the second Pharaoh of the Fourth Dynasty. This discovery was questioned in later years.